The Chesapeake and Delaware Canal East watershed (C & D Canal) contains the C & D Canal, a navigational waterway to the Port of Baltimore maintained by the U.S. Army Corps of Engineers. The canal system provides a continuous sea-level channel connecting the Port of Baltimore to the northern ports of Wilmington, Philadelphia, and northern trade routes. The canal carries 40 percent of all ship traffic in and out of the Port of Baltimore. The Chesapeake and Delaware Canal East watershed is one of only three tidal watersheds in the Chesapeake Basin. Soil types include the Matapeake-Sassafras association described by the USDA-Natural Resources Conservation Service as "well-drained, medium-textured and moderately coarse textured soils on uplands". The C & D Canal East watershed has several notable waterways including Scott Run and Lums Pond. The federal government owns nearly 9,000 acres along the Chesapeake and Delaware Canal. The land along the Canal is used for recreation, agriculture, dredge disposal and habitat. Man-made embankments along the canal are the result of years of disposal activity and mantenance of canal depths. Through a series of agreements, the states of Delaware and Maryland manage approximately 7,500 acres of property for recreation and wildlife management. The majority of the C & D Canal East watershed is rural with low marshland utilized primarily as wildlife habitat. There are also the developed areas of Port Penn, part of Delaware City, and St. Georges. Nutrients, physical habitat condition, and water supply are the main concerns in watershed. The Chesapeake and Delaware Canal East Watershed has a total of thirteen sites listed in the Site Investigation and Restoration Section database. There are six that are state-fund lead (HSCA) sites, four sites that are in the Voluntary Cleanup Program (VCP), two sites are listed as a Formerly Used Defense Sites (FUDS) and one National Priority List (NPL) site. In water bodies of the Chesapeake and Delaware Canal East Watershed, samples have indicated that PCBs, dioxins, dieldrin, DDT and chlordane are present in the environment at levels requiring further attention under the Clean Water Act (1972). 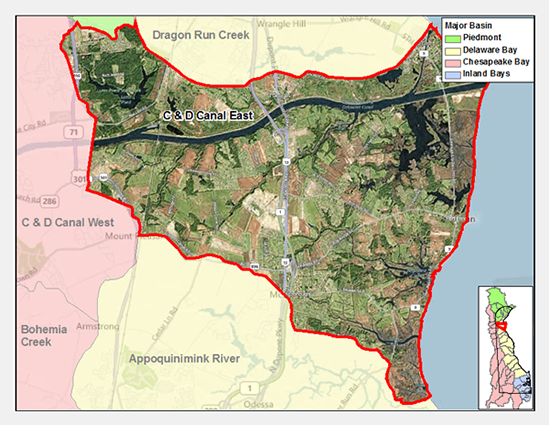 The Chesapeake and Delaware Canal East Watershed is on the 303d list of impaired waters as well as having State of Delaware Fish Consumption Advisories for PCBs, DDT, dieldrin and chlordane. If you would like to view reports for any of the sites in the SIRS program please follow the link the DNREC Environmental Navigator to search by map for the Chesapeake and Delaware Canal East Watershed. The Chesapeake and Delaware Canal is listed on the National Register of Historic Places and is designated as a National Historic Civil Engineering and Mechanical Engineering landmark. The canal is unique as the only major commercial navigation waterway in the United States built during the early 1800s and still in use. The U.S. Army Corps of Engineers maintains a Canal Museum at Chesapeake City which provides visitors with a glimpse of the canal's early days. The waterwheel and pumping engines remain in the original pumphouse, which is on display in the museum. These steam engines are the oldest of their type in America still on their original foundations. Other artifacts and exhibits in the museum detail and illustrate the canal's history. Lums Pond State Park is also found in the C & D Canal East watershed. Lums Pond State Park is built around the largest freshwater pond in Delaware. The park features fishing, boating, sports facilities, and hiking trails. Hikers have the opportunity to explore a variety of habitats along the 7.5 mile Swamp Forest Trail circling the pond. Lums also features over 10 miles of multi-purpose trails (horses, bikes, hikers, snowmobiles). The Whale Wallow Nature Center hosts a variety of programs for visitors during the summer season. Ball fields and game courts abound at Lums Pond State Park as well as the Summit North Marina offering private slips for 250 boats.